February - This time of year can vary so much but whatever it brings we always look forward to our week away with our friends. In all the years (over ten) that we've been doing this we've never failed to have a good time come rain, hail, sleet or snow. After the holiday the rest of this short month just flies by. As always we went away at the beginning of the month with our friends: the Cherries; Kews; Weavers and Wrights making ten of us in all. This year was a visit to Dorset staying in a large house just outside Swanage, a few miles from Corfe and within a mile of the sea. We all have different expectations of the week - walking; shopping; sightseeing or just sitting and reading but somehow we all manage a number of compromises and have a really good time. We tend to do a lot of walking and we probably walked most days because the weather was just too good not to be out taking advantage of the sunshine. 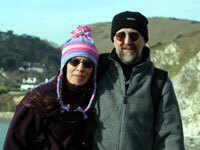 This is us above Lulworth Cove. 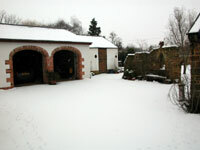 We came back from holiday to snow. The Dorset coast had experienced rain overnight but as the wet weather moved north it hit a cold front and turned to snow. Thankfully the journey back was not too bad but schools in the County had been closed the day before because of this sprinkling of snow. The English winters are becoming milder so it wasn't a surprise to us that the snow had melted away by the following day and so we missed all the fun. The weekend after our return from holiday we celebrated Jane's birthday. This is an annual event that Jane would prefer to play down but she has to participate or there would be little point to the whole thing. The usual suspects went out for a meal at the Yeoman of England in Wootton. Despite the table being in a smoking area we had a good meal with friendly service made all the better because it was a round table. We'd certainly go there again. Steve's glasses have been an on-going saga for the past two months. He needed to have an eye test because it has been four years since they were last tested. 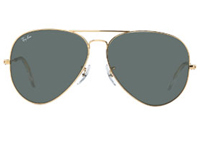 Eventually he found some frames (Ray-Ban Aviators) in Vision Express that he was reasonably happy with but he still liked his old ones better even if they were about to fall apart. He ordered them at the end of December and after 4 weeks he went to collect them. After wearing them over a weekend he wasn't happy with them - the photo chromatics didn't darken very quickly and he couldn't see clearly through them. When he returned them to the optician he discovered they were not glass but plastic lenses even though he specifically asked for glass. After trying again and waiting three weeks he decided to abandon all hope and cancel the order. 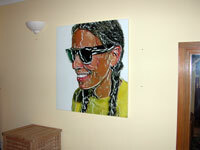 At long last he found some other frames he really liked in a small opticians in Northampton and he should be wearing them by the time the web site is updated next month - there might even be a photo. Towards the end of the month Murphy went off his food although he seemed ok in himself. He effectively starved himself for three days so Jane booked him into the vets. The morning he was due to go he started to eat again so she cancelled the appointment. The next day he went really down hill and so got him into the vets as soon as possible. After blood tests, a good dose of antibiotics and £150 he started to pick up quite quickly as pictured on the right. At twelve years old he is getting on a bit and we need to keep a careful eye on him. 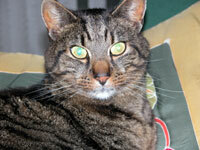 Latest news from the vets is his blood tests are clear - no cat leukaemia or cat AIDS thank goodness. 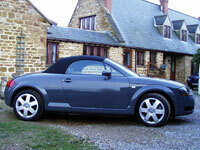 The Audi TT is now six years old and has only done 36,000 miles. They do say that short journeys are not good for a car - only time will tell. It got through the its annual MOT with some new bushes on the front anti-roll bar and new front brake pads. We intend to keep the car until Steve retires in about three years by which time it will have only done 48,000 miles and be nine years old - you could have worked that out for yourselves but it's easier to spell it out. To supplement our car investments we've been looking at Smart cars with the idea that Jane would use it for running to and from work or around town rather than destroying the planet (we think not) in the Honda CRV. Let's face it Jane gets 40 mpg from her diesel and Steve gets 25 mpg from his turbo charged gas guzzler so who says "ban 4x4s"?